You will see the many-headed hydra of commemoration throughout this special issue, a credit to my co-curators. There will be moments of resistance against the urge altogether, and yet the need and the opportunity to continue grappling with such aftermaths continues. It continues because our global capitalist imperialist drive continues, and this addiction, this compulsion, creates ever more aftermaths. Commemoration is both a necessary and an opportunistic urge. So we “(re)collect,” and in doing so, we manifest again all the old hurts, the old traumas, the old discourses, the old offenses. We re-purpose, we perpetuate, we re-perpetrate. And we collect anew. We consume even newer postwar novelty. We perpetrate anew. You will feel this tension throughout the curated collections herein. I begin with three personal narratives, a day in the life for each thematic of my title, to frame my vision for the work of the artists, activists and writers that follow. 1. When colleagues and new acquaintances inquire about my ethnicity, I tell an old familiar story, a story that now feels like a requirement, a license, and a justification of some sort of why I am mostly Vietnamese, a quarter South Asian Indian on my mother’s side, and an eighth Chinese on my father’s side, a reason why I may appear to be Filipina or Malaysian, or even Latina in my more sun-soaked athletic Spanish Club youth. Most are more curious about the Indian connection, deeming the Chinese presence to be de rigueur in Southeast Asia and uninteresting as one in every four persons in the world is statistically Chinese. It began with the first Indian in the family, my maternal great-grandfather, who left his Indian wife and two daughters in Chennai (then Madras) and took his two sons to settle in the Chợ Lớn Chinatown district of then Sài Gòn, Việt Nam. They opened up a small textiles and imports business bringing in French colonial goods from both French colonial India and France itself to Indochina, and the boys grew up speaking fluent Vietnamese. On the maternal great-grandmother’s side, the great-great-grandmother, who was part Mandarin, decided as Chinese imperial rule waned to employ her daughter in a French household in Huế to work as a seamstress, where the daughter then met her Vietnamese chef/husband, who labored in the same household. When the French colonists migrated south to Sài Gòn, the help moved with them. The great-grandmother would take the daughters into the Indian textiles shop to buy fabrics, and lo and behold, one of the Vietnamese daughters and one of the Indian sons hooked up. The randy teenagers were my maternal grandparents. I have not disappointed them. I leave that last point out. When folks hear this story, they tell me I should write about it, as if it is somehow unusual or unique, but in fact, it isn’t. Most “natives,” immigrants, refugees, exiles, diasporics, etc. have stories like this one. And when the Vietnam War, or the Cold War, “happened,” it happened to every one of these global migrants across the world, whether in Southeast Asia, in the U.S., Eastern Europe, East Asia, the Middle East, or Africa. Each had and has her/his own perspective and positionality relative to that war, and that War laid the justificatory groundwork and rhetorics for future global injuries elsewhere. So our cartographies, our mental mappings, of “the Vietnam War” must recognize the connections and layovers of itinerant imperial travels that go far beyond Vietnam, Cambodia, Laos, and the U.S. if we are to wrap our heads around this thicker historiography and all of its global and local aftermaths. 2. The network of academics in Viet Nam studies is a motley crew, and they too are global. Every now and then at a conference, a forty-five to sixty-year-old white male historian or anthropologist will approach me after a presentation I have given and speak to me in his best attempt at Vietnamese. Despite knowing the conversation that will ensue after hearing only a sentence or two of his Vietnamese and to nevertheless show positive reinforcement for his efforts, I respond in my Vietnamese native tongue. “Your Vietnamese is strange; you don’t use standard Vietnamese? I learned the proper official Vietnamese,” my composite interlocutor will then proffer, with no hint of self-reflection. In a momentary pause, I consider if I feel like explaining to him the difference between the version of Socialist Republic of Viet Nam nationalist Vietnamese language form he learned and the pre-1975 Vietnamese nationalist linguistic form I learned in the south, which was different from his northern Vietnamese, and also different from both the pre-1975 northern and central Vietnamese forms, all considered standard and official at that time and most taught by local or regional native primary school teachers, all of whom were gradually replaced by northern teachers after 1975 throughout the country. I consider asking him if he understands what centralization of government means in terms of national language forms, or if he understands the history of Southeast Asian language education in the U.S. and in Vietnam as it relates to the larger history of the military academic industrial complex. I want to tell him that if he were only ten years older, he would have learned my Vietnamese, because of that same military academic industrial complex during an earlier political climate. I ponder pointing out to him that his simplification, his simplistic simple-mindedness, reverberates with the same privilege of the imperial oppressor’s neoliberal re-narrativization of official histories, and that he sounds an awful lot like Homer Simpson without the charm. I wish I had the energy and investment to remind him that only a few years earlier, he and I had engaged in an email flame war on the Vietnam Studies Group (VSG) listserv over his pretentions to speak on behalf of all indigenous native Americans and how he could call them “Indians” if he wanted to, because he was one-eighteenth “Indian,” himself, thanks to his settler colonial ancestors. I repress visions of E. Honda pounding on a little man in a Street Fighter 2 scene. I decide, nah, maybe not today. 3. I was born with the name Lâm Thục Uyên, surname first, given to me by both my parents to connote two meanings of a bird that remembers to return to its home and of a depth of profound thought. But by 1976, my father had already been evacuated the year prior and the only way my mother and I could leave Việt Nam was with Indian passports authenticated with the help of my Indian grandfather. My mother already had both Indian and Vietnamese names, but I did not, so she pulled Mariam Beevi out of her proverbial arse, and plastered it onto my newly minted Indian passport. Once we arrived in Madras with no relations or resources, we assumed our refugee status and survived however we could for a year until my father was able to secure asylum passage to the U.S. Throughout childhood, I vacillated between these two names in legal documentation and familial contexts such as Vietnamese language schools or church documents, as well as other names: Ti Ti, Yoda, the Beev, Miriam, Beeverd, mini-B, Blam. I vacillated between a legal birthdate and a biological birthdate. My father was disappointed when I declined to recuperate his surname Lam upon U.S. naturalization at eighteen during a moment of feminist angst and a more nerdy fear that it would disrupt my college applications process. Citizenship, competing nationalisms, and patriarchy do not always align comfortably. By the time I became a faculty member, it was easier to tack the Lam back on to avoid prolonged authenticity discussions with students and colleagues alike. War nomenclature—The Vietnam War, the Second Indochina War, the Cold War, the American War, the American War in Vietnam, the Việt Nam War, etc.—are all similarly tactical instruments, each with their own designs and aspirations, loaded valences, and historiographical specificities. At times it’s fun to play with them; at other times, it’s mortally offensive to get the political historical usage wrong when hundreds of thousands of lives have been lost in the process. It’s even more loathsome when academic play with such significant terminology is only positioned as some act of (regressive) coolness. Asian American studies is not unfamiliar with nomenclature baggage, from hyphenation, virgule or space to hapa issues and mixed race studies. So we need the poets from the undercommons to help us with our stunted, stilted and stillborn vocabularies. We can afford to antagonize our own acts of naming with different titles and hailing, to provoke reconsideration of common “key” words. We need to speak less superficially, less neoliberally. We should yelp wildly and soundly. Eliza O. Barrios, D.K.C. 1, 2013. Graphite on paper, 14” x 9.” From the Sulat sa Pader (Writing on the Wall) Exhibition at MCLA Gallery 51, Massachusetts College of Liberal Arts. Courtesy of the artist/dedicated to E.R. Barrios. The invited contributors in this section all tell us new stories, they cover less traveled ground, they bespeak other aftermaths, both global and domestic. 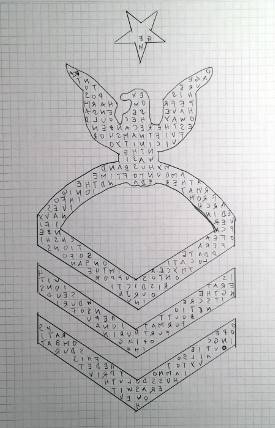 Filipina American artist Eliza O. Barrios deploys the text of her family’s letter to the Department of Veterans Affairs requesting support due to her father’s tour of duty in Vietnam. He had lived the majority of his life keeping the secret of his active duty of twenty-five-plus years. It was only after his death that the family discovered he had served five tours in Vietnam and had slowly suffered the effects of Agent Orange and never sought treatment. They realized this personal history most likely contributed to his alcoholism. Along with additional pieces from Barrios’ Writing on the Wall series, we include images of her series of six drawings in graphite on paper, entitled D.K.C., dedicated to E.R. Barrios, which served as a personal homage to her father after his death on February 23, 2013. Yong Soon Min, Copter Three. Bleed digital print image, 7” x 9.” Photo images courtesy of Im Heung-soon, THIS WAR, 2009, Achim Media Publishing. Activist artist and academic Yong Soon Min’s conceptual painting, Surfin the Cold War Camouflage, and her three bleed printed images further fan the flames of other war stories of heroisms untold. 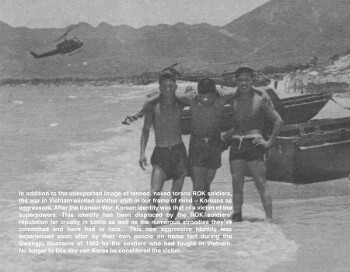 In the latter works, Min combines the photographs from Im Heung-soon’s THIS WAR (2009) with her own text and installation practices to challenge mainstream perceptions of Korean soldiers or “mercenaries” enlisted to fight in the war with sights and sites of pleasure, pain, passion, and play. These images themselves bleed into the iconic image of the decorated American veteran’s cap, a cap that saw active duty across both Korean and Vietnam Wars. Together with a book like Jorge Mariscal’s Aztlán & Viet Nam: Chicano and Chicana Experiences of the War (1999), Barrios and Min allow us to think of other(ed) players in this ever-expansive war. Writer Lan Cao, attorney Hoi Trinh, and photojournalist Nick Ut are all individual subjects and direct by-products of this war. Author of two novels, Monkey Bridge and The Lotus and the Storm, Cao re-positions political centrality away from the U.S. and onto its historical allies, President Ngo Dinh Diem of South Vietnam and President Hamid Karzai of Afghanistan. Activist Hoi Trinh takes us on a journey more concrete than critical refugee studies by documenting the history of stateless boat refugees left to linger in camps over the past four decades. The VOICE documentation provides a salient alternative archive to any official nationalist historiographies. These are the liminal figures missing from cartographic borders. Nick Ut & Phan Thị Kim Phúc at 40 Year Reunion. Vietnam, 2015. Photograph by Raul Roa. Huỳnh Công Út, known professionally as Nick Ut, is the Associated Press (AP) 1973 Pulitzer Prize winning photographer for “The Terror of War,” depicting children in flight from a napalm bombing. 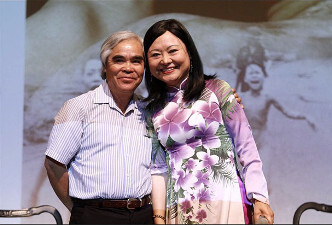 His iconic photo of a naked nine-year-old Phan Thị Kim Phúc running toward the camera from a South Vietnamese napalm attack on North Vietnamese invaders at the Trảng Bàng village during the Vietnam War made him the third person inducted by the Leica Hall of Fame, in September 2012, for his contributions to photojournalism. The five photographs I curated here shift our attention from the spectacle of that iconic photo capture and its media aftermath to the life and work of the media producers during and after that war. Most do not know that Ut rushed the young girl to the hospital before scrambling to submit the photographs to AP on assignment. Most do not know that he had an older brother, Huỳnh Thành Mỹ, also an AP photographer, who died on assignment—shot while awaiting medical evacuation for an earlier gunshot wound—in the Fall of 1965. Most do not imagine him on assignment in Korea during the Vietnam War, but why wouldn’t one think a visit to another demilitarized zone might be effective international pedagogy? Most do not see his intimate friendships and collegiality with more mainstream celebrity war correspondents, such as George Lewis and Peter Arnett, built upon a strong foundation of having shared a long tortured war history together. Most do not see that he himself must participate in the spectacle on commemorative occasions, such as “reconciliation” photo ops with DRVN war photographer Đoàn Công Tính in Việt Nam each time one of them publishes a new book. These are stories Americans don’t hear when they obsess over Kim Phúc. Poet, teacher, and U.S. Army veteran Soul Vang is one of the most earnest men I have ever met. His poems grapple with what is gained and lost in relations between an ethnic minority within minorities and the mainstream. Lao American writer Bryan Thao Worra is unique in his choice of horror and science fiction genres. Kao Kalia Yang considers the intergenerational debt accumulated by the Hmong who start all the races so far behind the pack. All three of these writers have had to act as institution builders in their respective genres and communities, and this has meant having to create and grow networks, to fight with media outlets, and to nurture what will come after them. These are no small feats. Finally, Mai Der Vang, Kosal Khiev, and Alexander Ratanapratum represent the next generation of writer/artist/activists that triangulate the complexities of historiography—its failures and its lack—with the future potentials of Asian American literature and arts activist practices with aesthetic panache. Kosal Khiev is a Thai refugee camp-born exiled Khmer American poet, tattoo artist, and survivor of the U.S. prison system deported to Phnom Penh, Cambodia, where he currently writes and performs. Through spoken word, he transforms his anger, regrets, and experiences into a poetic art form that calls attention to the plight of these offspring of ludicrous U.S. carceral management and incomprehensible international policies. Hmong American Mai Der Vang and Thai American Alex Ratanapratrum combine their artistic ingenuity and poetic creativity with broader conceptualizations of memory, (dis)identification, the social political, and the everyday. My hope is that all of these contributions move you, and in so doing, that you will join us in moving the conversations around this war to other spaces and places, to alternatively imagined cartographies.